Trimethoprim is a type of medicine called an antibiotic. It works by interfering with the ability of bacteria to produce proteins that are essential to them, which causes them to die. The active ingredient is absorbed into the bloodstream and deposited in the infected tissue and urine. Trimethoprim is a prescription-only medicine. Respiratory infections such as pneumonia, middle ear infection, sinus infection and acute bronchitis. The active ingredient trimethoprim works fast, providing relief from symptoms such as pain, fever and malaise within only a few days. Trimethoprim tablets should be swallowed whole without chewing with some liquid. The doctor will tell you how long you need to use this medicine. It is important that you finish the prescribed course. Stopping early could cause the infection to return. If this medicine is used for bladder infection, the tablets should be taken just before going to bed to allow the medicine to act while you sleep. Adults and children aged 12 and above: 200 mg, twice daily. The doctor may recommend taking a dose of 300 mg once a day in the evening for the treatment of urinary tract infections. For children under the age of 12 a different dosage regimen will be necessary. Always follow the prescription exactly - never use more or less than the doctor recommends. Read the package leaflet before use. Skin rash, possibly with itching. Consult a doctor if these or other side effects are severe or persistent. For more information, see the package leaflet. You have a blood disorder. 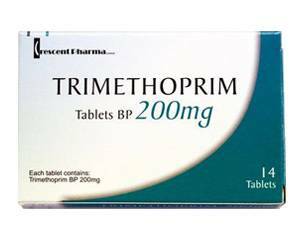 Consult a doctor on the use of Trimethoprim if you have a health condition that is not listed above or are currently on medication. Trimethoprim should not be used, or only with a doctor's approval, if you are pregnant or breastfeeding. This medicine does not affect your ability to drive. This medicine does not interact with alcohol.